3 s Tbs Chocolate Syrup. Bake Brownie mix(whatever kind you like folowing box instructions) on pizza pan, let it cool. 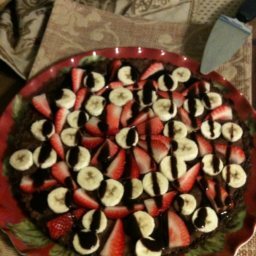 Put sliced bananas & strawberries on top (whatever way you like) Drizzle chocolate syrup on top and "voilà"!!!! !